Continuing the reflection of James Beck’s sad death and the disappearance of Walker from the platoon, we come to the episode The Recruit in which we and the platoon say a last goodbye. It is hard to imagine how the team felt at the loss of their friend and colleague and I imagine the atmosphere on set was pretty sad. But it in no way stopped them from doing what they did best – making great comedy. 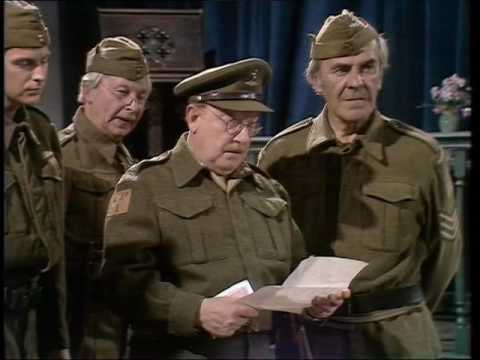 Explaining Walker’s absence from parade via a note in which Walker characteristically tries to bribe Mainwaring to let him off, this is the last time Walker is mentioned in Dad’s Army on television (though the character would be played by other actors on stage and in the radio series). It is amazing that, after such a big loss, Perry and Croft were able to put together such a great episode and I’ll come back to The Recruit as we get closer to the big 50th anniversary. This entry was posted in blog on July 16, 2018 by wolAdmin.